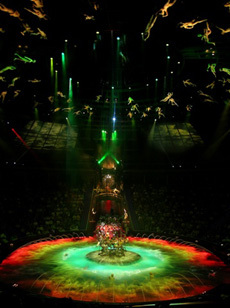 The Sandman himself, Franco Dragone, former creative influence for Cirque du Soleil, has created a portal into the world of dreams. This unparalleled, stand alone show has been nestled quietly in both the spectacular Wynn Resort and the unbridled subconscious of all. It doesn’t take long to realize he Le Reve stage is one of the most technically advanced pieces of entertainment equipment that may exist. It’s multidimensional levels that constantly change shape, rise from and fall into the depths of an element that has given the show it’s glorious identity…Water. Water immersing, complimenting, seizing everything. Yet take care not to let the senses get lazy and focus solely on the sparkling abyss in the center of the showroom, for anything can turn up in a dream. The walls can come to life and fantasy’s creatures can dribble in from every…look around…corner…and crevice. Time to sleeeeeeeep. A lovely girl in a red dress, the dreamer, lies in a daze upon her bed which floats atop crystal blue water. Her guide through the subconscious, a dream master of sorts of whom resembles a dark wizard, cues the magic and madness to begin. Angels, devils, and characters from the deepest corners of a wild mind flood the stage by air, water, and land. Heart pounding acrobatics, divine balancing acts, and red heeled (along with one pair of sea monster legs) synchronized swimmers take no time to dance to the dreamer’s fancy, all of which are under the mercy of the some very unconventional circumstances…they’re all soaking wet. Sounds impossible yes, but there are no limits in this journey through dreams. Franco Dragone stays true to the unpredictable nature of the subconscious world (and real world for that matter) with performances that begin in a very light-hearted state yet end in utter turmoil. For instance, the thougtful dreamer may be at one point flying through the air with angelic white figures in a dynamic partner aerial act and the next moment be tossed amongst the horrors of fear and despair. Nets full of lifeless bodies raise from the water as storms, chaos, terror, and 80 foot falls into the cold eternal water replace the once tranquil sleep sancturary. Just as there is the beautiful dream, exists the dark nightmare. But fear not, the mood will be lightened in true Dragone/Cirque fashion with a little more clowning and swim caps between acts. From a strip tease gone wrong to reviving a fake dove with CPR, these fellows play a detrimental role of reminding everyone during the happiest or grimmest of times that the world’s too mysterious; don’t take it serious. in and out of a hanging giant metal sphere. Each of their moves determines the others’ fate under the most daring and dangerous conditions. Still there’s always the wild card that dreams can throw in, nonsensical and representative of nothing but the truth that there aren’t always answers for everything; things may be imperfect and incompl…Such as tables and chairs spinning in the air with ambitious diners upon them (try eating in that breakfast nook). And it’s almost as though this peculiar vision provoked the breech of the borders back to reality. With her, the dreamer took no definitive answers to anything, no perfect truths except one: All is possible. The red dressed beauty said farewell to her creatures of the cerebral beyond and lied once again upon her floating bed.